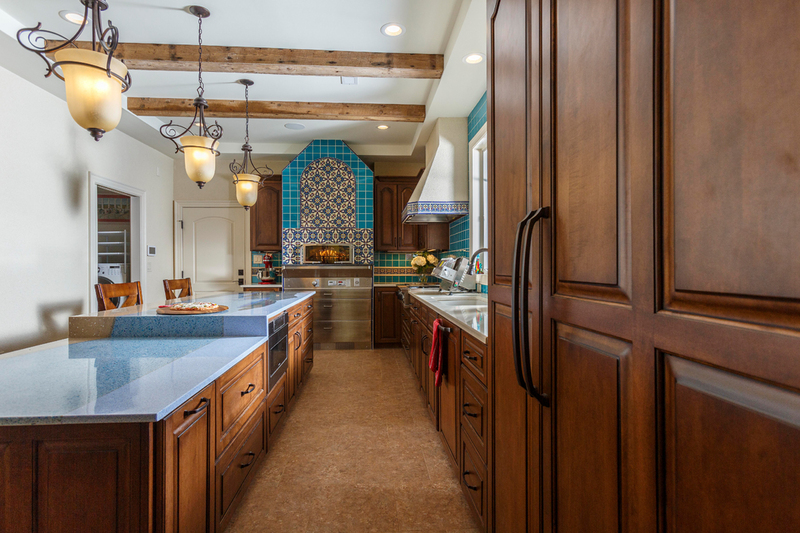 Bright colors, stucco walls, simple baseboards, wide archways and reclaimed wooden beams sourced from the Habitat for Humanity ReStore in Durham evoke the hacienda style. 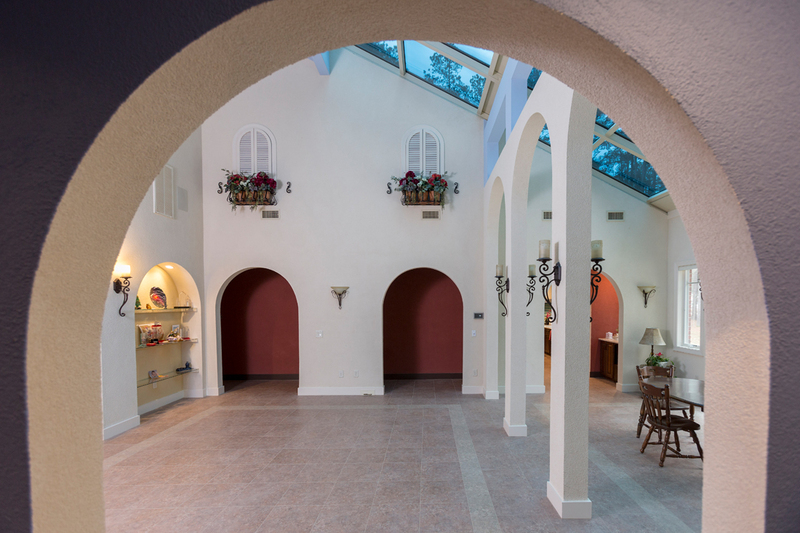 Above this indoor courtyard, shuttered window boxes add charm, and a unique electrochromatic skylight system allows the Toebes to darken the room with the touch of a button to control the indoor climate and block UV rays. 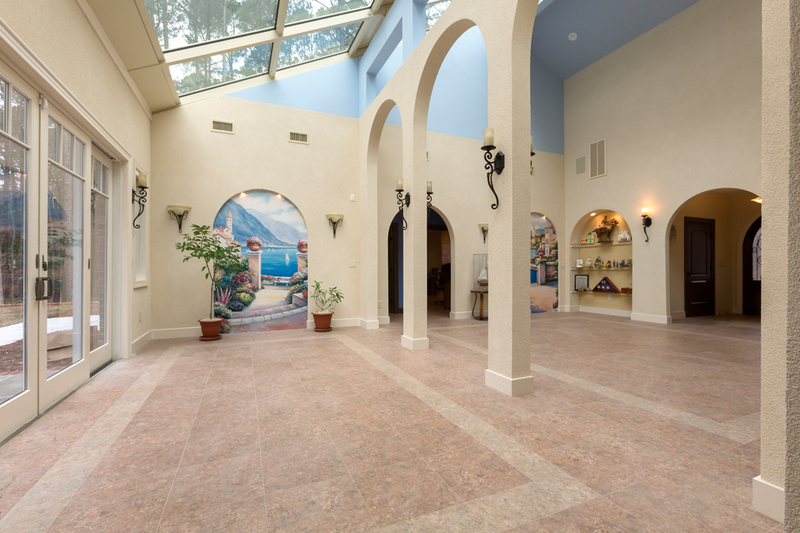 As it says on the welcome mat, John and Mary Ellen Toebes called their home Hacienda Para Siempre, their “forever home.” The Spanish courtyard style is inspired by John’s teen years living in Madrid. The Toebes' commercial pizza oven is the first to be installed in a local residence, and is surrounded by colorful semi-custom Talavera-style tile, also reflected in the range hood and on a nearby window over one of their wine refrigerators. Coordinating solid color tiles are used in the backsplash. Have you found the fridge? It's behind the wooden cabinet panels beside the wall ovens. The Toebes' commercial pizza oven is the first to be installed in a local residence, and is surrounded by colorful semi-custom Talavera-style tile, also reflected in the range hood and on a nearby window over one of their wine refrigerators. Coordinating solid color tiles are used in the backsplash. John Toebes demonstrates the home’s commercial pizza oven, the first to be installed in a local residence. The oven is surrounded by colorful semi-custom Talavera-style tile, also reflected in the range hood. Coordinating solid color tiles are used in the backsplash. 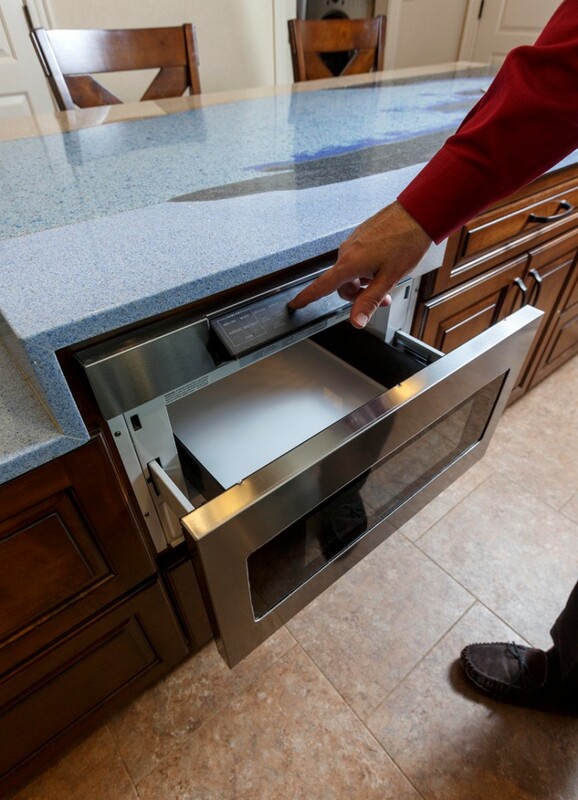 An accessible drawer-style microwave is built into the kitchen island. 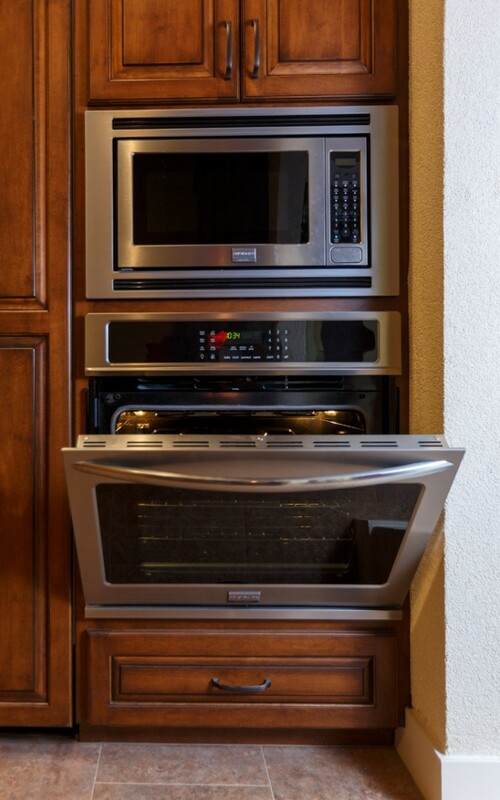 Wall ovens are strategically placed in this universal design. 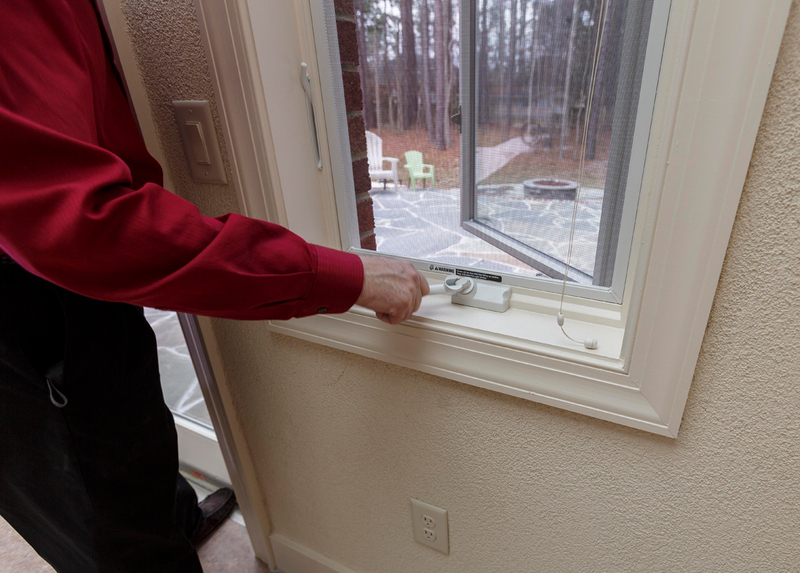 Easy-open casement windows are among many universal design features in the Toebes’ residence. “A universally-designed home can be as unique and beautiful as any other home; it’s all in the design choices you make,” Williams said. 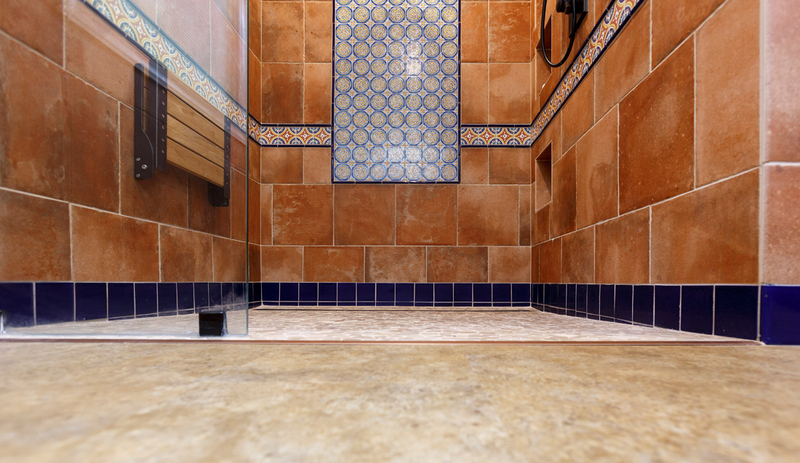 These floors resemble terracotta but are made of a commercial grade luxury vinyl tile that offers threshold-free movement from room to room and is more forgiving in falls. “Several different colors and sizes of LVT were used to add interest in the foyer, great room and dining room in particular,” says designer Sally Williams “You want to keep the manufacturer’s finished edges as much as possible in working with LVT, rather than cutting it to fit, so creating patterns is particularly tricky. 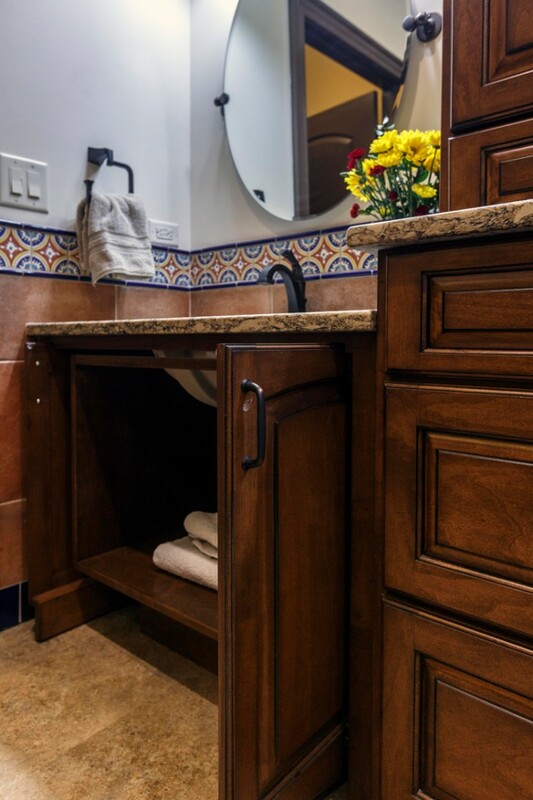 Accessibility is key in the home’s bathrooms, which feature pocket doors in the two-level vanities to permit wheelchair maneuverability, and tilting mirrors. In the shower, a drop-down bench, dual water controls and a handheld option address future needs. 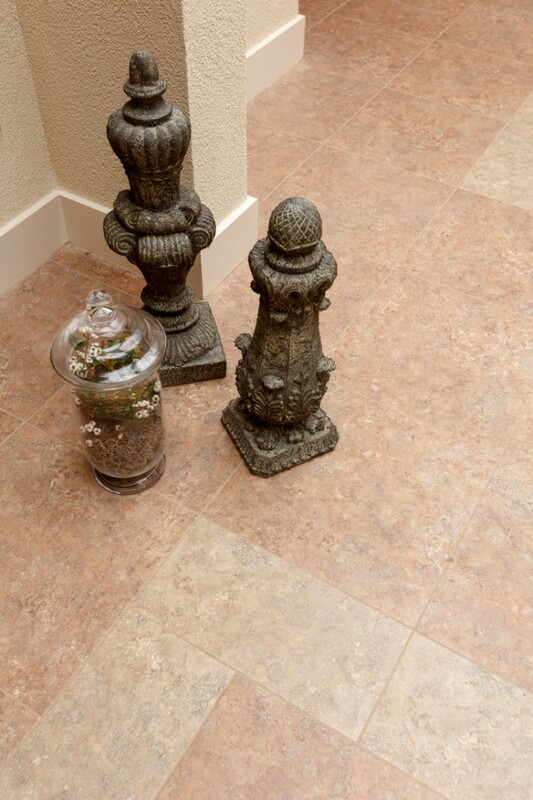 The luxury vinyl tile is used throughout the house, with flooring transitions in only two places: from LVT to tile in the walk-in shower and from LVT to carpet in the theater room. Two-level vanities in the bathrooms permit wheelchair access, should they be needed in future. 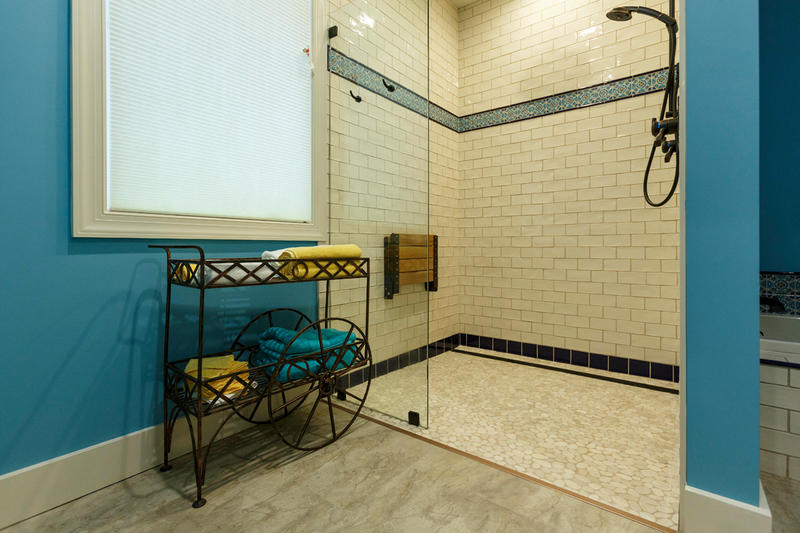 Accessibility is key in the home's bathrooms. In the shower, a drop-down bench, dual water controls and a handheld option address potential aging in place needs. 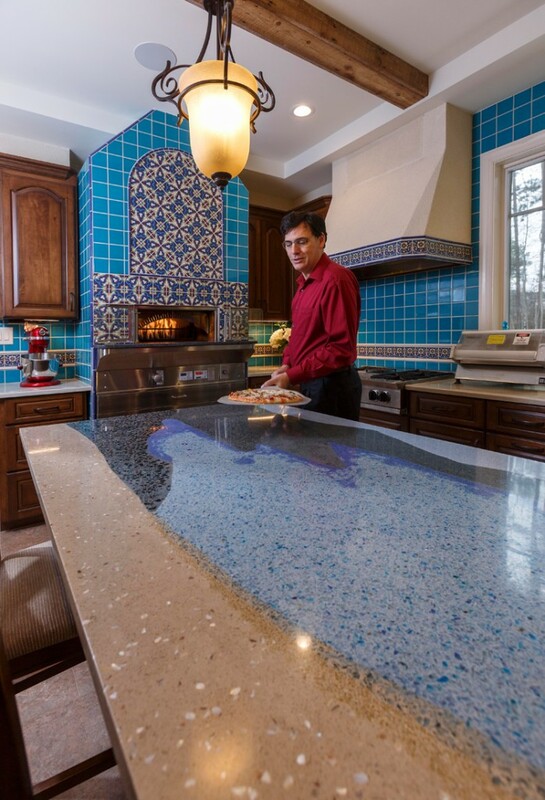 The centerpiece of the Toebes’ kitchen is an 11-foot, dual-height Environite island custom-designed by Sally Williams, featuring recycled glass, mirror, mother of pearl and multiple shades of resin. 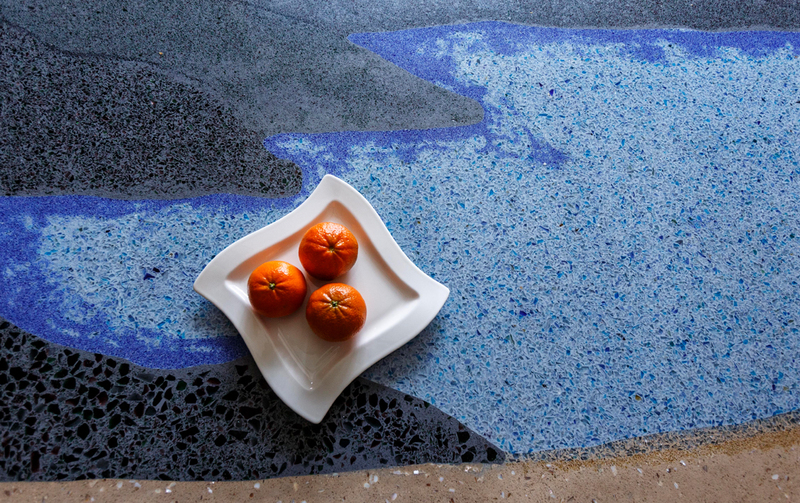 The counter captures the Spanish Mediterranean coast, from sand and sea to sky and mountains. 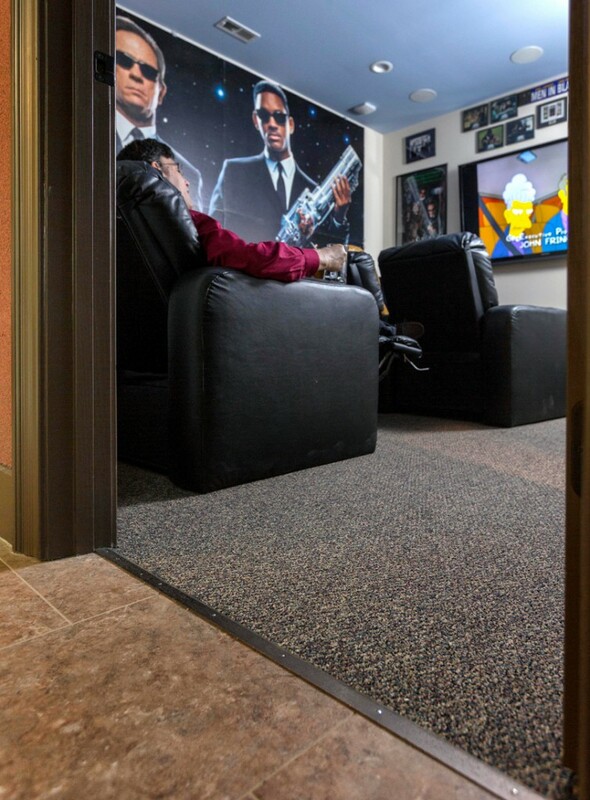 An avid innovator, John Toebes served as producer for the “Men in Black” game on PC, and his MIB-themed theater room features original and signed memorabilia. Subtle or hidden technology is a priority in the soundproofed home, including 57 Ethernet drops, eight cameras and a central control room to manage it all. 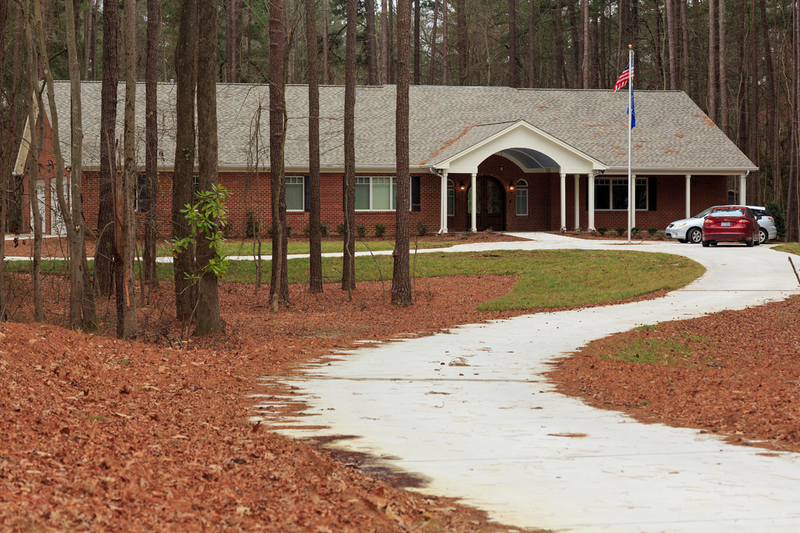 Cary homeowners John and Mary Ellen Toebes built their new home using barrier-free universal design standards that will enable them to age in place. 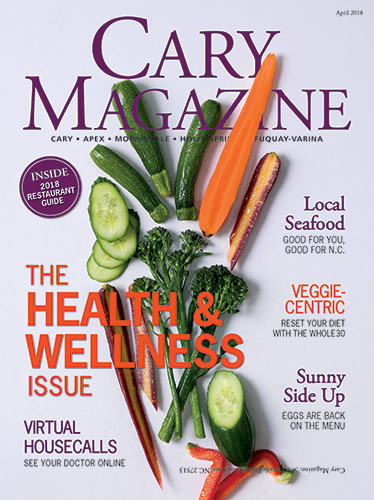 “Universal design is truly for everyone,” says designer Sally Williams. 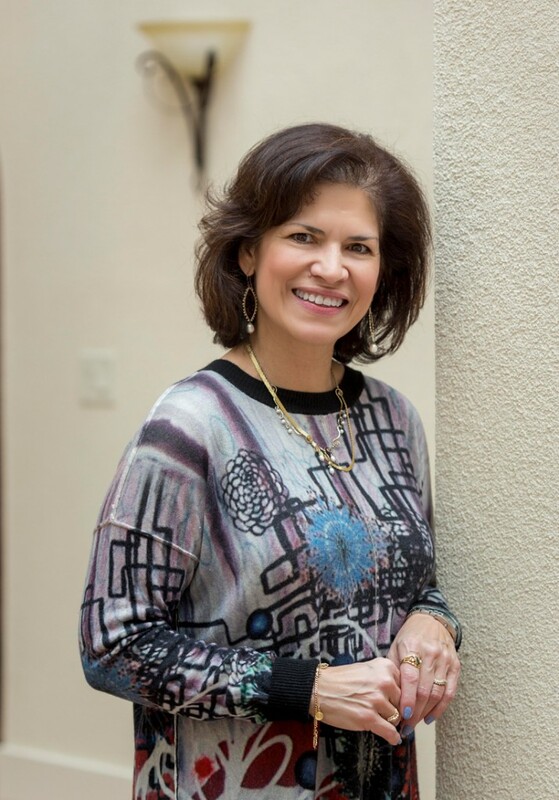 “Whether or not you’re aging or handicapped, an entire home with wide doorways and hallways feels much more spacious and comfortable than one with narrow doors and halls." 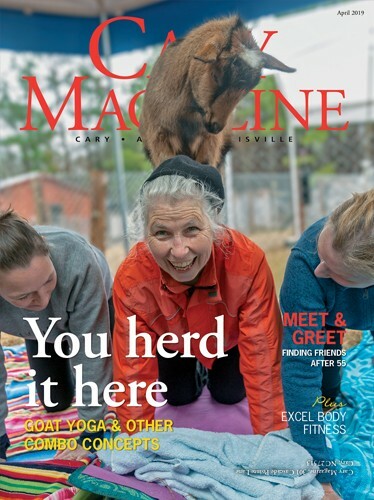 From the outside, John and Mary Ellen Toebes’ brick ranch-style home is noteworthy because it sits on a 5.2-acre wooded lot in downtown Cary, where residential land can be hard to find. Open the door, and you’ll find that’s just the beginning of this home’s surprises. Brightly colored stucco walls, shuttered window boxes and reclaimed wooden beams evoke the open Spanish courtyards John loved when he lived in Madrid as a teenager. Above, a two-story electrochromatic skylight system controls UV rays and tints for an almost-instant “evening” charm. 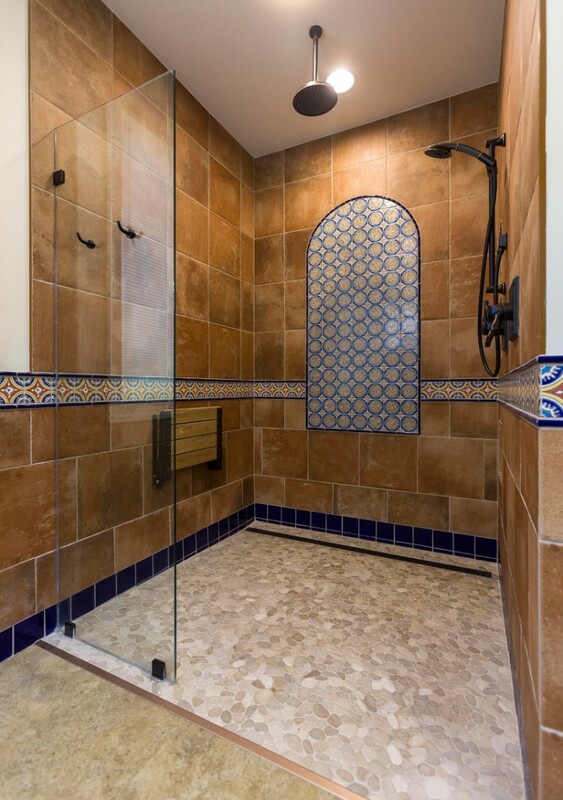 A contractor who is trained and experienced in universal design will also have experienced subcontractors, such as shower glass and tile installers who can properly install no-threshold showers. Should you want the assistance of an interior designer, be sure that designer is also trained and experienced in universal design. 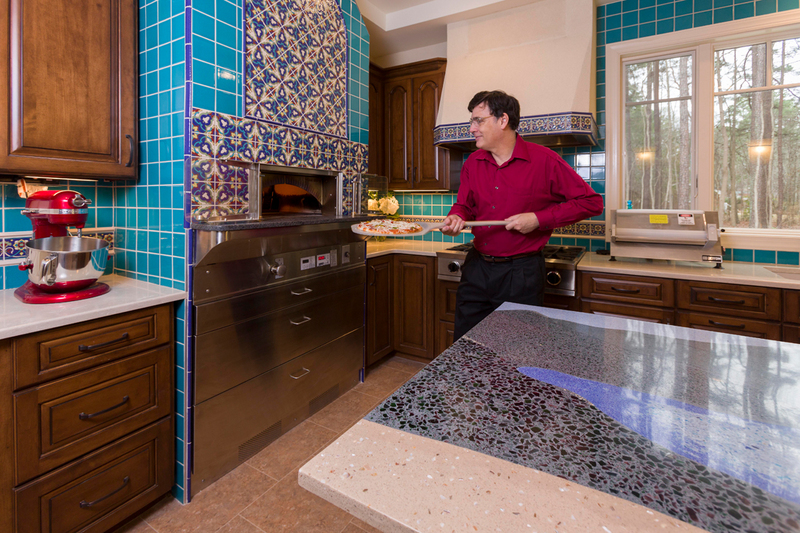 In the kitchen, Talavera-style tiles surround Cary’s first residential, commercial-grade pizza oven. And an 11-foot, dual-level island topper depicts the coast of the Spanish Mediterranean in recycled glass, mirror and mother of pearl, in a unique design created by the Toebes and their interior designer, Sally Williams of Cary-based Colorful Concepts. But the biggest surprise of all is that this house was built using universal design standards to allow the world-traveling Toebes, in their 50s now, to age in place. They call it Hacienda Para Siempre, their forever home. 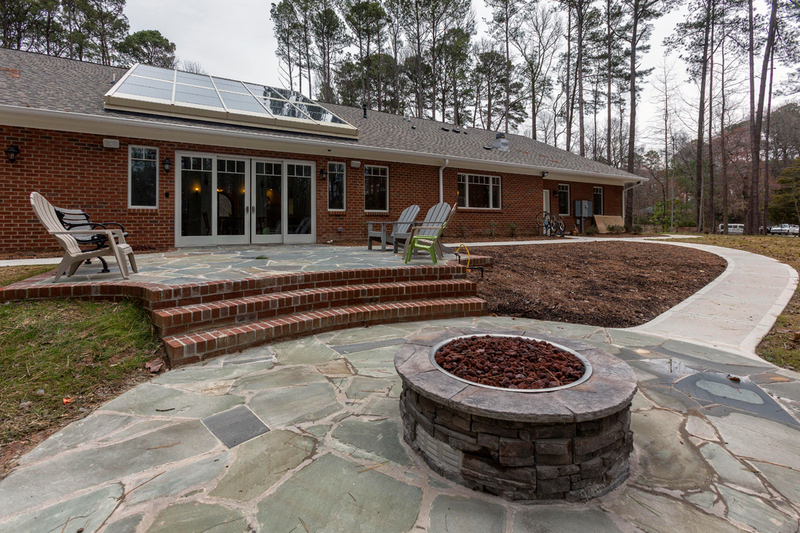 This forward thinking is growing in popularity among area homeowners, says the Toebes’ homebuilder, Lewis Sadler of Cary-based Sadler Construction. “People are looking at their homes as homes again and not stock options,” Sadler said, “and when you make that kind of long-term investment, you want it to last. “They understand that we are saving them money by eliminating the need to renovate their home later in order to stay in it. With over 10,000 people turning 60 every day in this country, the need is growing. The list of universal design features incorporated into the Toebes’ home “goes on and on,” Sadler said, and includes step less entrances; curb less showers; appliances and switch plates located at accessible heights; pocket-door vanities in the bathroom and easy-open casement windows. North Carolina has two licenses for builders: Residential and Building, which requires Americans with Disabilities Act knowledge. For universal design applications, hire a contractor with a Building license. Research builders in your area. Is universal design work part of their business model? 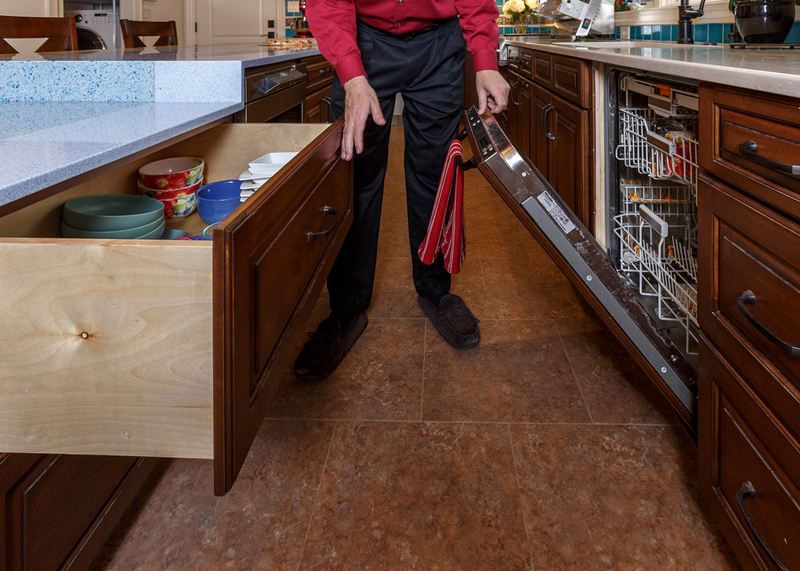 Call your local Home Builders Association to learn who builds universal design or has the Certified Aging in Place Specialist (CAPS) designation. The Home Builders Association of Raleigh-Wake County can be reached at (919) 233-2033, or hbawake.com. 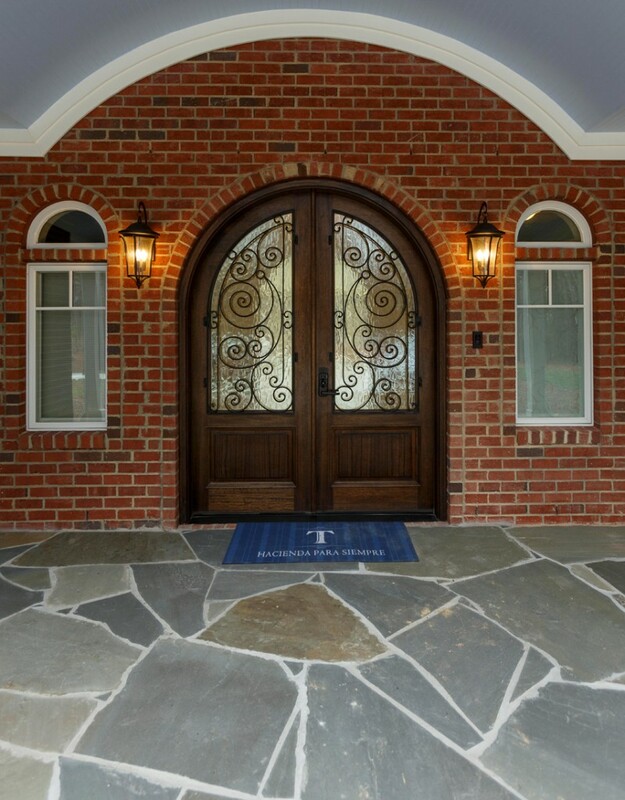 To eliminate the chance of a builder missing something, use a plan company that knows universal design; Sadler uses Cary-based Lifestage Home Designs, lifestagehomedesigns.com. A less extensive alternative to universal design is Visitable, which requires one step-less entry and an accessible bathroom on the main level. The Toebes, after an extensive search, chose Williams to manage not their general décor, but their home’s key interior design elements, thanks to her ability to adapt high-quality concepts to their unique requirements. The venture was quite different from typical projects, Williams says, particularly when it came to flooring materials. She used luxury vinyl tile throughout the home to provide a softer surface in case of falls, with the exception of a low-pile commercial grade carpet in the theater room and ceramic tile on the shower floors. Williams says universal design is truly for everyone.